This is not the task to create exactly the picture as you can see it in my example. 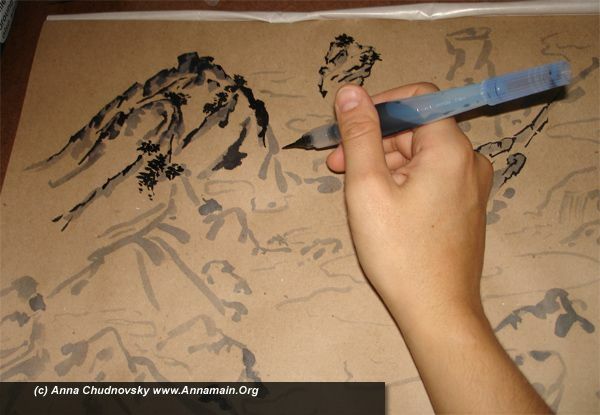 The point is how to feel the way of brush and ink, to control the movement meditate and enjoy the process. As you feel better your mind will became silent and peaceful and so your picture naturally, spontaniously will flow from your finger to a piece of paper. This is the real treasure of such painting with deep blessings for your body and soul. 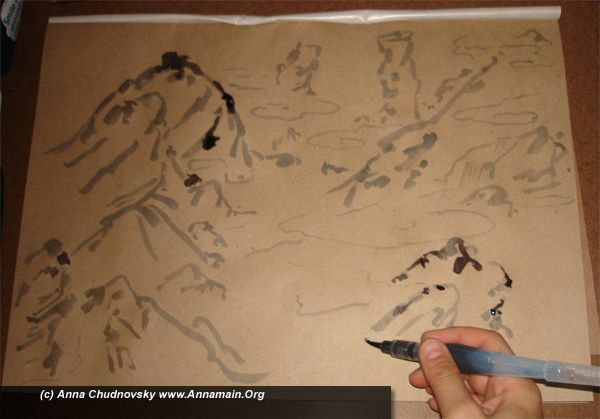 The first step it to create mounting shapes with light ink. 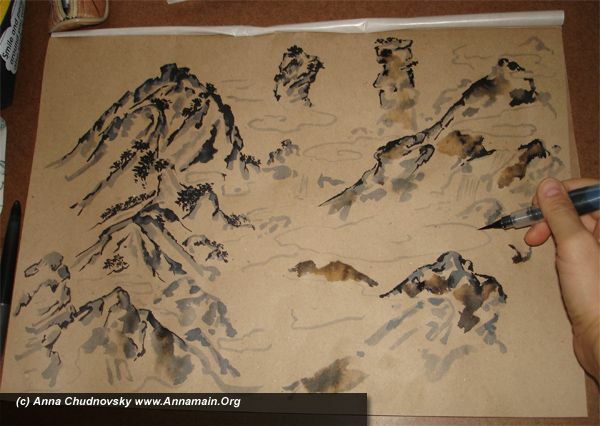 You can use 1 part of black ink and 2 parts of water as I did, or another proportion as you like. With free light movements create profile of the mountings as you can see on the picture, or may be another shapes as you like. 2 step - with black ink create cutouts of the mountings near soft lines you did. This is no reason to do it exactly close to gray lines. You only position is to make free and flow lines wiith different width and feel, feel the energy flows down through your fingers and soul. 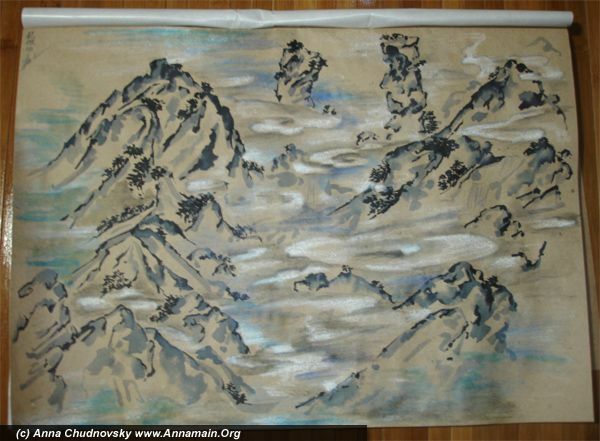 This is the main reason even warriors different kinds of Eastern Mortial Arts practice calligraphy and painting. 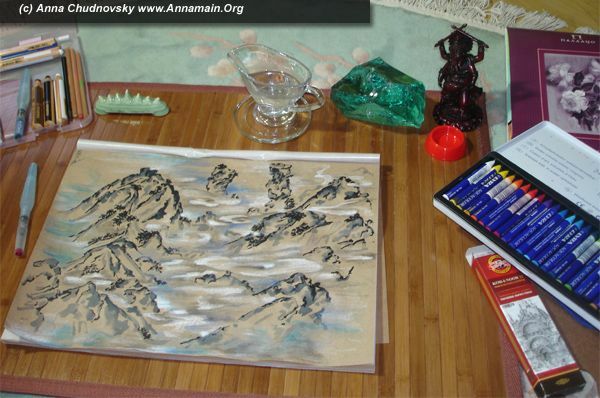 This things are polish the soul and create peace in it… and I did it while I studyed Kung Fu. 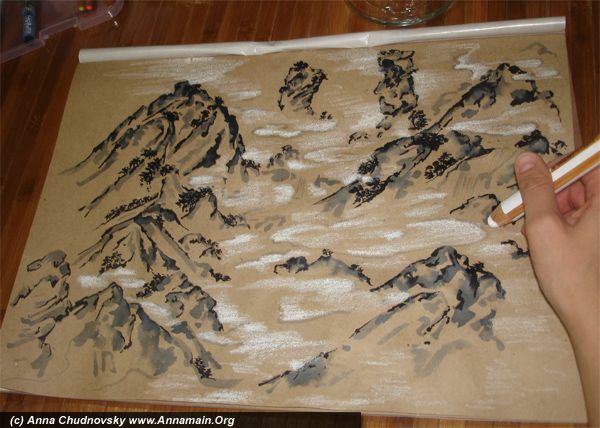 Everyone today has a kind of Kung Fu in real life resolving problems, making negotiations… so the art of meditation in painting is actual too. 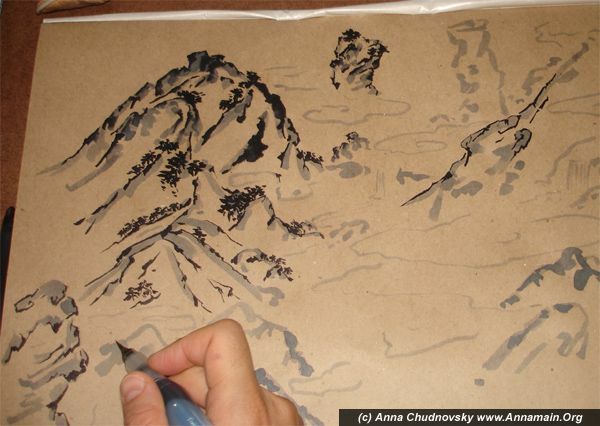 See it closer: the small strokes represents trees and bushes and makes the mountings lively. And zigzag main line creates the shape of the rocks. Without vacillation and fear do the same as you feel it, every result will be great on that way. 3 - do the same with all mountings. Breath deeply and free, release your shoulders and hands. Let your creative energy flows. 4 - as you paint it may be a feeling what gray lines ought to be in different places. Do it as your feel, let your intuition to suggest. Enjoy it. 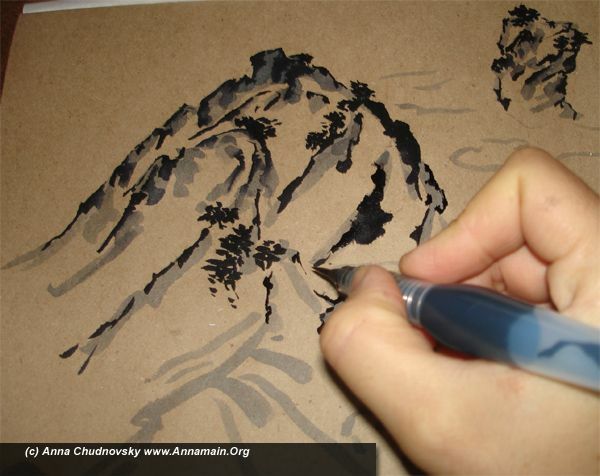 5 - finish all strokes with the black ink, make trees and bushes by short strokes. This is the final stage with ink. Enjoy your picture, and if you like it let it be and be finished on that stage. 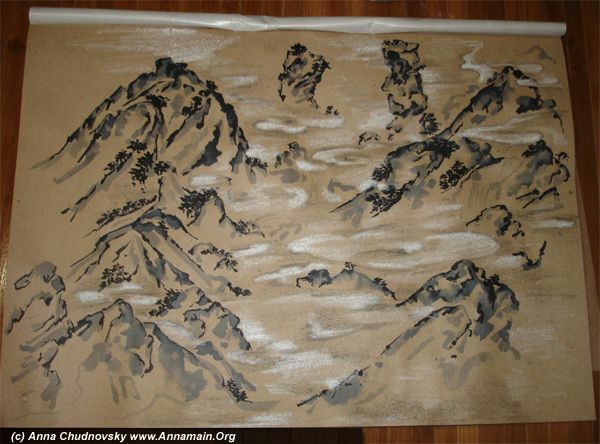 6 - if you like to continue make the clouds with white charcoal, or pastel or watercolour. Use matherials as you like and feel yourself confident. If you choose a white paper for the picture you can change the color for clouds from white to light blue. 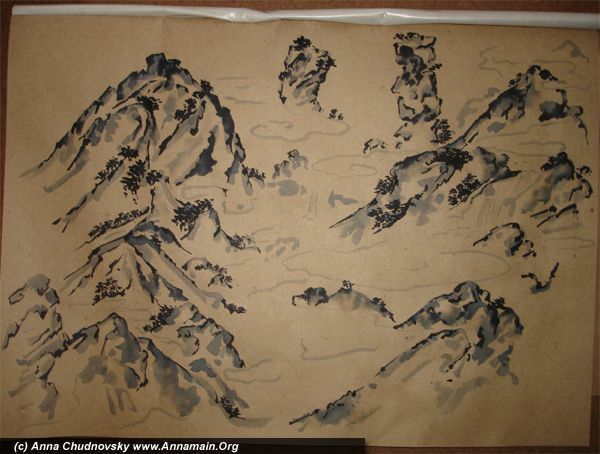 Try to feel how clouds covers the roots of the mountings, how it moves… Feel it in silent mind and enjoy the process. 7 - use different colors to lay movement to the picture. It may be any light color you like, for example I choose blue for my pictures and it seems as everning. If you choose pink it will be the time about sunrise. Congratulations! The picture is completed! I would like to say it again and again; you feelings, your intuition are the best part of such painting. Let it be. Feel your soul. And then as your mind will be silent you could listen a music of Existence, a music of God. Let it be! Fantastic paint! I like all the painting. How can it possible to doing so nice painting. I really appreciate your work. Thanks! your artifact with valuable advancement is perfectly loopy and stabilizing for us because it’s belongs to whatsoever fit techniques for breadth blogging.roaring abbreviate it’s maximal complex. Very nice post. I absolutely accept a acceptable timethe account Keep up the acceptable work. You make experience a place here. I have study a lot about this on early articles published by previous people, but I primary admit that you clear proved your point here! Will exist back to read more such of your greatest selective information! Me and my acquaintance were argument almost an issue similar to this! Instantly I recognize that I was powerful. lol! Thanks for the selective information you position. Gives Thanks for this. I got the connect from a commentary you left at different site and found it to be a great compiling of the story thus far. Here’s imploring for the integrity of the swap. Your post is really heart touching,I also got a lot of information from your article. Valuable information I found, keep on posting. Thank you for your post. The Crisp Canvas Prints can make canvas prints as your wish. Good day everyone! Happy New Yr and additionally of course Merry Christmas. I feel a tad overdue with the actual greetings i’m sorry about this. Just want to commend the person responsible of the actual website with respect of the really wonderful work accomplished. I will come to this web page a lot more regularly. I will be still in college and I ‘m occupied authoring term papers. Overall, my truthful greetings to you and all the finest. Howdy there! I actually love the sense and judgement of the writer. Very good to observe such concepts reviewed on the net. You certainly should encourage website visitor interaction and debate . Stick to the excellent work! Impressive material. Thanks for your internet site.